Sweet chestnut is one of the deciduous trees here. We have them growing along the stream bed and up on the northern facing slope of forest. They remind us of times past when there was more water here. They show a history of being coppiced, each one having many trunks – long straight and reaching upwards. The big hands of leaves offer a vibrant lushness to the summer landscape. The huge flowers present a feeling of generosity and sensuality. The fruits – the chestnuts themselves are rich and sweet food for people and animals. The wood is hard and rot-resistant due to its tannin content. 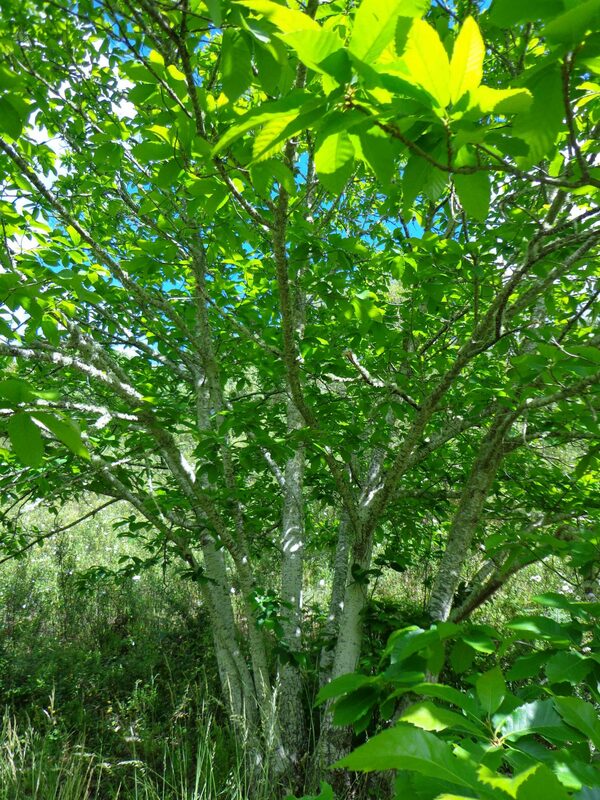 Coppiced chestnut was often used for fencing posts and outdoor constructions. Sweet Chestnut is one of the Bach flower remedies, and I had read his account of making the essence from this tree. I decided to follow his lead and make the essence with the boiling method. It felt right for this tree to use the element of fire to energise the water. Firstly because of the size and robustness of the flowers, and also because of the energetic I sensed from the tree, as having a strong yang upward moving energy. In Taoism the upward energy is used in “fire method” practises which are practises that push through blockages. As Bach writes about the boiling method – the heat from below carries up from underneath towards spirit. As the flowers collapse and disintegrate during the course of the 30 minutes of boiling it symbolises the breaking down of old patterns. The water and fire – the gentle and fierce – combine. I arrive early at the first tree that has the sun touching it. It is a dew filled clear summer morning. The wild oregano is starting to flower. The long dappled limbs of the tree grow straight and clean, without forking. The younger branches are smooth and pale greyish. The older trunks have thicker and rougher bark. The big leaves and rustling in the breeze. Bringing a sense of freshness and renewal, of expansiveness, generosity, and boldness. The sound of the leaves feels healing. I feel the upward force of the tree. A feeling of perseverance. Of cutting through. Of freeing deep blockages. The cutting through is also presented in the pointed teeth of the leaves – like a saw. The leaf is papery strong, smooth with clear straight veins. This growth upwards – towards the light represents a reaching for spiritual solace. Of rising up out of despair. Finding expression of the soul through creative work. I start moving along the valley, following the sun, to collect flowers from other trees big and small. I arrive at a big chestnut that has space to spread its branches wider as well as upwards. It has some long horizontal limbs. Its refreshing quality invites me to climb inside its trunks and hang off its limbs playfully. After sitting with the trees and collecting the flowers, I take them to the kitchen for the the boiling. As the pot boils it produces a rich pungent aroma. Even though the flowers are being cooked, it feels like a living process. An alchemy. A condensing of energy into a powerful, punchy remedy. The cooling process then adds a stage of settling, gathering, and calming of the fire energy. After the water has cooled and I have decanted the mother essence. I taste the remaining water and it is slightly bitter. It supports the ability to move forward, and to focus on what is most needed. For those who feel stuck, in despair, lost. Not knowing how to move or what to focus on. It is an activator that gets things moving. This powerful essence helps to transform our shadows. Supporting us to find the courage to face deep hidden dark emotions and core subconscious beliefs, to bring them into the light to be seen clearly and integrated / dissolved. It is indicated for those ready to face the deep patterns that drive them in to behaviours they no longer wish to have. The words “blessed relief” came to me. Supports creative expression, and courage to bring this expression out into the world, to be seen. The big sensual flowers symbolise a strong fertility – each having both male and female aspects. I feel the essence can also be used for channeling sexual energy in a healthy and balanced way.